Roy Wood, one of the architects of ELO and The Move, possessed some of the most eclectic tastes and interesting ideas of any pop artist of his time. 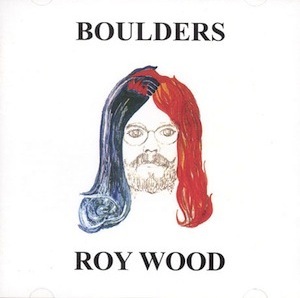 Boulders, his self-produced 1969 (though released 1973) solo outing combines the hard rock swagger of The Move with Wood’s own classical tastes, pop composition skills, and general studio wizardry. A brilliant listen from start to finish, opener “Songs of Praise” might throw off the casual ear with layers of harmonized vocals, but throughout the record the dubbed vocals are played almost as masterfully, though more humorously to be sure, as our old friend Nilsson. There’s the brilliantly produced “Wake Up,” with double-tracked acoustic guitars in stereo, flutes, cello, and—wait for it—percussion from a puddle of water. Elsewhere we hear sped up and slowed down vocals, plentiful horns and woodwinds, delicate sleigh bells, shakers, tiny mistakes and xylophone accents. There are a million precious details sounding as if Wood had picked out toys and instruments from the studio like it were a candy store. Additionally, it gives the feel of a fellow finally getting the control over the studio he’s always needed and just having a blast with it. It is comforting in a strange way to know the record was designed entirely by Roy, making each ornament of sound stand out a bit more. That percussion from a puddle is absolutely hypnotizing. Thanks for this! brilliant, I’ve never heard it before, so thanks for opening my mind and ears! Dude, you had me at ELO. Man, I have to pee now. this record is a got-darn classic. thx for the write up, Justin. A largely underappreciated artist for sure. Wonderful. What a surprise since I never heard it in its day—why I this site! A truly great album, and Mustard ain’t bad neither. I always liked Eddie And The Falcons, too. Roy has a lot of great singles released only in England. Great Phil Spector-ish productions. There’s also the touching track “Miss Clarke and the Computer” which is reminiscent of the scene in 2001 where HAL gets *spoiler* unplugged.